Do you have a minute to spare to learn some English? 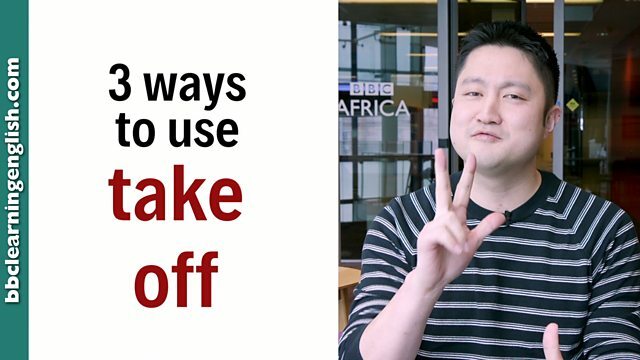 Here comes Kee to keep you in the know with three ways to use 'take off'! Give us 60 seconds and we'll give you the English! Hi, this is Kee from BBC Learning English. Today I'm going to tell you three different ways of using the phrasal verb take off. First, we use take off to describe removing clothing. It's really hot here so I'm going to take off my jumper. You can also separate take and off and say: take my jumper off. Second, we use take off to describe something becoming successful. I'm going to be rich. My business has taken off. Third, we use take off to describe not going to work. I'm going to take a day off work tomorrow. So, we can say: take off my jumper, or take my jumper off. My business has taken off. And lastly, take a day off. 'Take off' is a phrasal verb. This means it is a verb (take) followed by a particle (off). Phrasal verbs are tricky because they can have many different meanings depending on the context. Take off can mean remove clothing. With this use, take off is separable. This means that the item of clothing can go between the verb and the particle. It's warm here. I'm going to take off my jumper. It's warm here. I'm going to take my jumper off. Please take off your shoes when you come inside. Please take your shoes off when you come inside. Take off can also mean become successful, especially suddenly. I'm going to be rich. My business has taken off. I never liked his music, but it's taken off quite recently. Everyone is listening to it. Take off can be used with a time word to mean have time away from work. She asked to take a week off next month for a holiday. 'Take off' can mean remove clothing, become successful or have time away from work. Look for clues in the sentence. What does 'take off' mean in this sentence: Take it off right now. It's too hot outside for that. 'Take off' can mean remove clothing, become successful or have time away from work. Look at the verb form. Is the thing taking off or being taken off? There is a difference! Which of these can take off? Look at the verbs in the answers very carefully. Which of these would you say to your boss if you were sick?